In 1873, because of the transition of the right bank of the Amu Darya River from the Khiva Khanate to Russia, Petroaleksandrovsk city including Sirdarya Region of the Russian Empire was founded on the place of Khiva fortress Turtkul. Petro-Aleksandrovsk fortification (the original name of the city) became the residence of the head of the Amudarya department of Turkestan military region. The head of the department carried on correspondence with the khan of the Khiva Khanate. In 1920 Petroaleksandrovsk was renamed Turtkul. 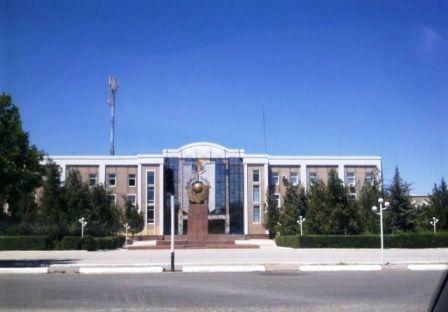 In 1932 – 1939 it became the capital of Karakalpak ASSR. In 1949 because of the undermining, the city changed its place. Turtkul is situated on the right bank of the Amudarya, 35 km. from the railway station of Urgench (in line Chardjou - Makat), 170 km. from Nukus. In Turtkul there is about 22 thousand of people. Today Turtkul is one of the large cities of Karakalpakstan. There is TV in the city. There are 6 colleges in Turtkul region: Turtkul Bank College, Turtkul Industrial and Pedagogical College, Turtkul Medical College, Turtkul Agricultural College, Turtkul Industrial and Transportation College and Turtkul academic lyceum.